The main difference between cache and cookies is that cache is a temporary memory to store web resources on the client’s machine to load the web pages quickly while cookie is a small piece of information stored in the client’s machine to maintain user’s preferences and browsing activities. Cache or web cache is a temporary storage that saves web content for future requests. On the other hand, a cookie is a small amount of data generated by a website. The web browser stores that data to remember user information. It is similar to a preference file created by a software application. Cache is a temporary storage that stores web page resources on a client’s machine to load the web pages quickly. It is also called web cache or HTTP cache. When opening a website that consists of images, videos, etc. it takes some time to load the website. To avoid that, the web browser stores the site content such as images, audio etc. on the user’s computer. Therefore, the next time when he visits the website, it loads faster than before. For example, if a user visits www.pediaa.com website frequently, the browser stores the logs, navigation bars etc. in his computer’s browser cache. The next time the user visits this website, the browser can use those saved data to load the pages quickly. Overall, the cache provides accessibility to the required web pages within a short amount of time. Therefore, it helps to improve the web browsing speed. A cookie is a small piece of data sent from a website. It is stored on the client computer web browser. For example, assume the user visits an online shopping website. He adds various items to his cart. Cookies help to remember this kind of information. Furthermore, it helps to track the user’s browsing activities. It records the button clicks, logging in and records of the previously visited pages. It also keeps details such as names, addresses, passwords etc. the user types on websites. Furthermore, cookies store information for a short period of time. Then, that data expires. 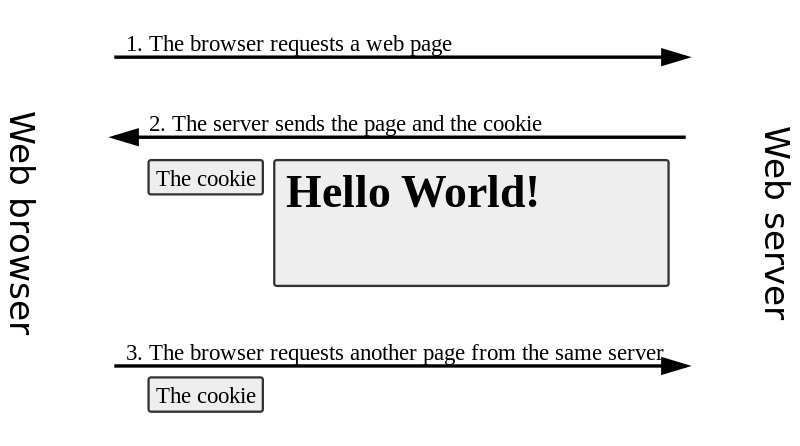 Overall, cookies help to maintain the client’s states. On the other hand, they will not work if the browser disables the cookie. Moreover, cookie objects can only store textual information. Cache or web cache is a temporary storage of web documents such as HTML pages and images to reduce server lag. In contrast, a cookie is a small piece of data sent from a website and stored on the user’s computer by the web browser. These statements describe the main difference between cache and cookies. Cache stores web resources such as videos, images and audio while cookies store information on user preferences. Hence, this is another difference between cache and cookies. Moreover, cache is available in the client’s machine until the user removes it manually. However, a cookie expires after some time. Function is another major difference between cache and cookies. Cache helps to load the web pages faster while cookies help to store stateful information and to record user’s browsing activities. 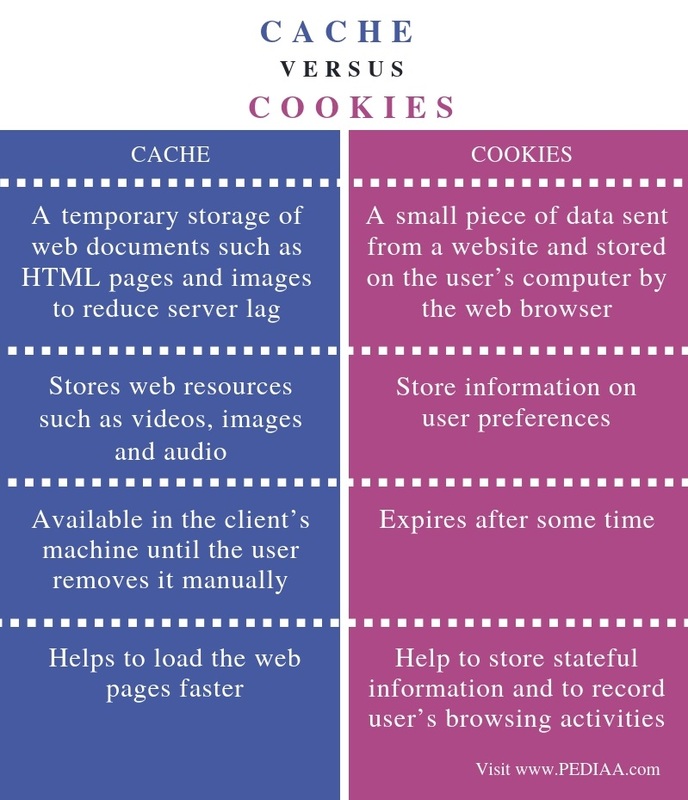 The difference between cache and cookie is that cache is a temporary memory to store web resources on the client’s machine to load the web pages quickly while a cookie is a small piece of information stored in the client’s machine to maintain user’s preferences and browsing activities. 1. “Web Cache.”Wikipedia, Wikimedia Foundation, 7 Nov. 2018, Available here. 2. “HTTP Cookie.” Wikipedia, Wikimedia Foundation, 8 Nov. 2018, Available here.